I write this diary from the Sealers Bay hut, Codfish Island, Whenuahou. I have just arrived on this beautiful 1396 hectare nature reserve which lies to the north west of Stewart Island, in the most celebratory fashion. I was flown in on a fixed wing light aircraft across the Foveaux Strait which homed in on a magnificent landing on Sealers Bay beach. I hadn’t known what to expect of Cod fish Island but the sight I beheld surpassed my wonderings and wanderings. Sealers bay is a kilometre long white sandy beach, consolidated by perfectly formed sand dunes that rise towards a coastal ridge. Behind this ridge, flowing forest laden slopes arise from which, native bird song emanates. Looking north from the beach is the magnificent view of the Ruggedy mountain range which are situated in the Northwest corner of Stewart Island. These stunning jagged peaks were uplifted from the sea approximately 130 million years ago. I have arrived with two others at this haven with a specific and single purpose; to volunteer in the Department of Conservations Kakapo Recovery Programme as a supplementary feeder. No visitors are allowed without a permit. Having entered the kakapo’s domain, I am beginning to get to know them on a first-name basis – all 75 known kakapo on the island have been named. The Kakapo Recovery Programme was initiated by DOC in 1987 and its purpose is to prevent extinction of New Zealand’s critically endangered Kakapo. In 1990, Rio Tinto Alcan New Zealand Limited became the major sponsor of the Kakapo Recovery Programme in Partnership with DOC and Forest & Bird under the auspices of the Threatened Species Trust. The Kakapo is a species of nocturnal parrot with finely blotched yellow-green plumage endemic to New Zealand. It has a distinct facial disc of sensory, vibrissa-like feathers, a large grey beak, short legs, large feet, and wings and a tail of relatively short length. A certain combination of traits makes it unique among its kind—it is the world’s only flightless parrot, the heaviest parrot, nocturnal, herbivorous, visibly sexually dimorphic in body size and is the only parrot to have a polygynous lek breeding system. It is also possibly one of the world’s longest-living birds. The traditional diet of kakapo is strictly herbivorous and includes the fruits, seeds, bark, bulbs, leaves, stems and roots of lots of native plants. On Whenuahau, it is boosted with a special pellet, which is part of the supplementary feeding programme provided to keep the birds in good reproductive condition, and help produce more eggs in breeding seasons. 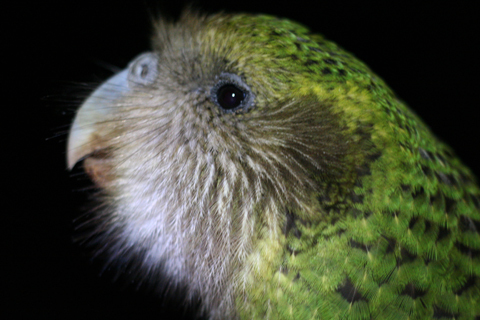 During breeding, the pellets will also help mothers raise their chicks if rimu fruit is in short supply. I certainly feel very lucky at this moment, to have this opportunity to assist in this worthwhile cause and make sure the birds are in good condition for their upcoming breeding season. I will keep you posted with my progress and any meetings with feathered friends! What a great way to be spending your time, Heather. While everyone else is rushing around shopping for Christmas, you’re rushing around feeding kakapo and helping to save them from extinction! My husband and I are bird lovers from the United States. 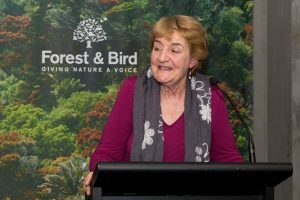 We’ve been members of NZ Forest & Bird since we first found out about the society while walking through a kauri forest, when two women who shared binoculars with us, mentioned that we should become members. When we visited Stewart Island, we especially enjoyed a tour of Ulva Island, by a man who had worked for the Dept. of Conservation. He gave me a kakapo feather. We have watched videotapes about kakapos, listened to their unique birdcalls, and I have a book about Hoki, the kakapo. When we return to New Zealand, the one thing I would want to do most would be to see Sirocco. Kakapos are my favorite bird. Whenua Hou, what a place! 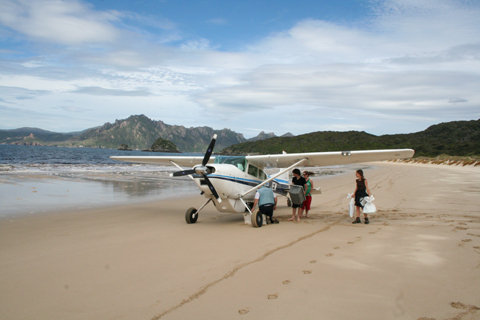 I too have been lucky enough to land on the beach, stare at the mountains of Stewart Island, sit in the hut and have great conversations, watch the flocks of parakeets and listen to the fernbird. I have even caught and held a kakapo in the name of conservation. I thought kept recurring to me though is how lucky I was and how great it would be if more lucky people got the chance to visit this place. Especially kids or anyone with an open mind. Theres nothing like a moment on a pest free island to make a conservationist for life. We have to get more people to these places! I’m very aware of the management issues general and specific, so lets not get into details, but I’m interested in where the sentiment lies…and I’m not convinced Ulva island is the answer either, it pales in comparison. i think the solution is not to overload such a small island with increased visitors but to actually create more and larger reserves. plane loads of people will disrupt what is already a fragile environment that cannot fully support the kakapo as it is.